1989 Galway: juvenile/first-winter, Galway City Dump 11th to 31st March (Kilbane, 1989). Additional photographs in Dutch Birding 11:82 and Cottridge & Vinicombe (1986). 1990 Cork: juvenile/first-winter, The Lough, Cork City Dump and Cobh, 21st February to 5th March (Wilson, 1990). Additional photograph in Enticott & Tipling (1997). 1997 Antrim: juvenile/first-winter at Belfast Dump, 1st to 7th March 1997 (McGeehan, 1997; McGeehan & Garner, 1997). This record has been accepted by the Northern Ireland Birdwatchers' Association Records Committee (NIBARC) (Irish Birds 7:100). 1998 Donegal: adult, Killybegs, 22nd February to 10th March (McGeehan & Millington, 1998). Additional photograph in Birding World 15:73. 1998-1999 Mayo: juvenile/first winter, Newport Dump, 19th December 1998 to 3rd April 1999 (Lonergan, 1999). Additional photograph in Birding World 12:93. 2003 Donegal: juvenile/first-winter, Killybegs, 2nd to at least 5th February. Photographs in Birding World 16:50 and 16:124. This record has yet to be formally assessed. Norway 2000: juvenile/first-winter, Bergen, Hordaland, 3rd January (Mjøs, 2000, 2002). This record has been accepted by the Norwegian Rarities Committee who treat Thayer's Gull as a full species (Mjøs & Solbakken, 2001). Denmark 2002: juvenile/first-winter, Hirtshals Havn, Nordjylland (North Jutland), 15th to 16th January and, what was considered to be the same individual, some 150 km to the south-west, at Hanstholm Havn, Nordjylland (North Jutland), 19th February (Kristensen, 2002; Klein et al, 2003; photographs in Birding World 15:8 and 15:101). This record has been accepted by the Danish Rarities Committee (Sjældenhedsudvalget) who also treat Thayer's Gull as a full species. After due consideration of all of the documentation, the IRBC has concluded its assessment on the first four claims in the Republic of Ireland, (The 1997 Belfast record has already been adjudicated upon by the NIBARC, see above). The Cork, Donegal and Mayo records have all been accepted; the Galway record is considered indeterminate on current knowledge. The IRBC has decided to follow the prevailing view that Thayer's Gull is best treated as a full species rather than as a race of Iceland Gull L. glaucoides and consequently Thayer's Gull L. thayeri is now formally added to the Irish List. The reasons for the delay in the Committee's decision were outlined in previous IRBC Reports (Irish Birds 6:92-93 and 6:409). The additional observation in Ireland (as well as two others in Europe) since our last statement on the subject, as well as detailed studies of the morphological characteristics of adult Thayer's Gulls wintering in central California (Howell & Elliott, 2001) and adult Kumlien's Gulls L. g. kumlieni wintering in Newfoundland (Howell & Mactavish, 2003) have added significantly to our understanding of their identification. However, given the unstable taxonomic history of Thayer's Gull (see below) as well as the seemingly continuous evolution of identification criteria it is more than likely that these decisions will, at some stage, need to be reviewed in the light of future developments on the subject. The taxonomic history of Thayer's Gull is among the most complex of any gull species and has been the subject of considerable debate and controversy ever since the taxon was first described in 1915 (Brooks, 1915). A number of fundamental questions concerning its taxonomy remain unanswered, as has been recently highlighted by authors such as Howell (1998), Pittaway (1999) and Howell & Elliott (2001). Readers interested in a fuller discussion of the current debate are advised to refer to these papers. 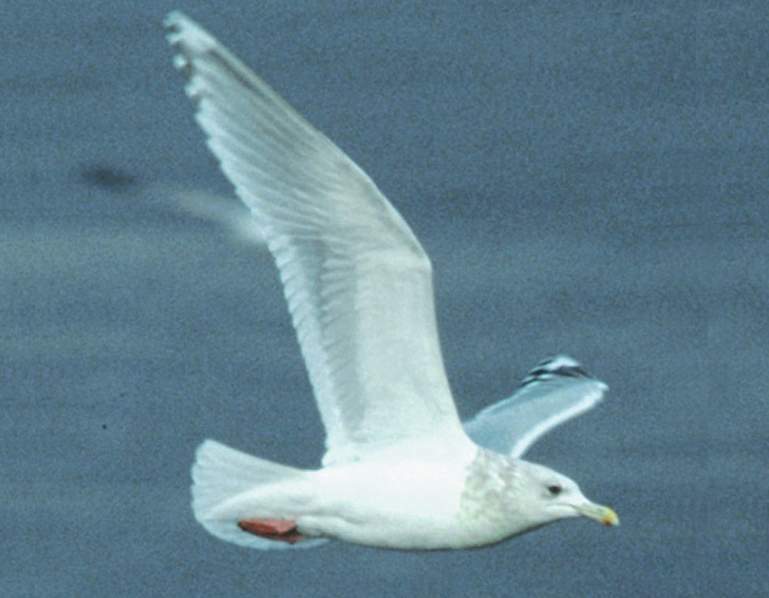 Since first described by Brooks (1915), thayeri has been treated at various stages as a subspecies of Herring Gull L. argentatus, a subspecies of Iceland Gull and as a full species L. thayeri. The form is currently regarded as a distinct species by the American Ornithologists' Union (AOU, 1998). An extensive study by Smith (1966), based on three seasons of observations and a series of elaborate experiments among breeding thayeri, kumlieni and L. a. smithsonianus in eastern Baffin Island, described how reproductive isolation was complete in areas of sympatry. 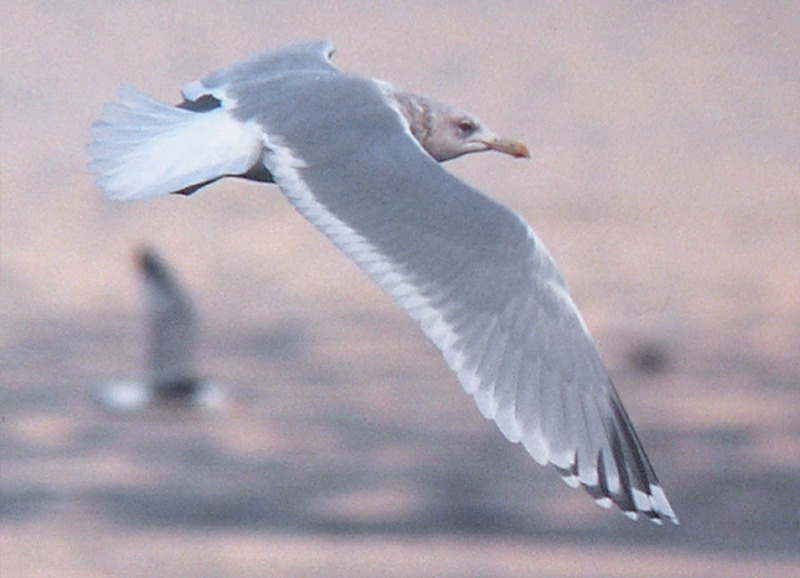 Largely on the basis of Smith's findings, the AOU (1973) decided that Thayer's Gull should rank as a full species. Later, however, Smith's study was regarded with scepticism by a number of authors who demonstrated that his results were fabricated to an unknown extent (Sutton, 1968; Snell 1989, 1991). To add to the confusion, however, Snell (1989) apparently oversimplified his separation of thayeri and kumlieni types nesting on Baffin Island and the validity of his results (and his recommendation that thayeri be considered a subspecies of Iceland Gull) has, in turn, been questioned. Despite these doubts over the work of Smith, the AOU, in its revised checklist (AOU, 1998) continued to treat thayeri as a full species. Pittaway (1999), who presented an overview of over forty contributions to the debate published between 1917 and 1999, drew attention to numerous authors who disagreed with the AOU's taxonomic decision and he advocated 'lumping' Thayer's Gull with Iceland Gull. More recently, after detailed study of adult Thayer's Gulls wintering in central California (Howell & Elliott, 2001) and of adult Kumlien's Gulls wintering in Newfoundland (Howell & Mactavish, 2003), the treatment of thayeri and glaucoides as separate species has been advocated. 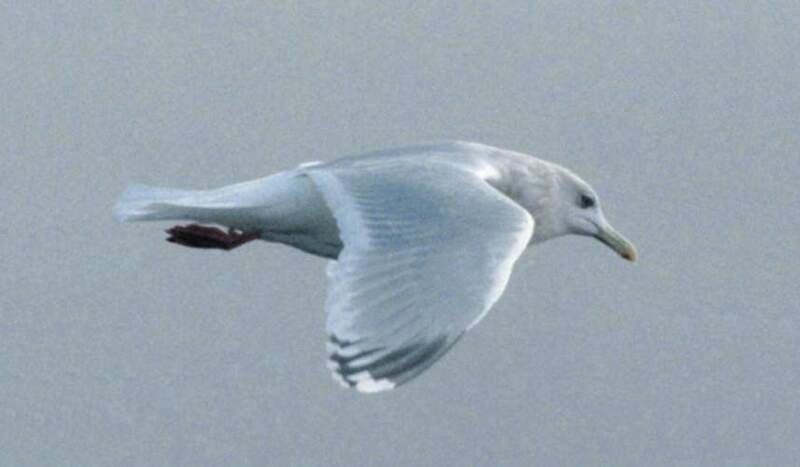 The situation with kumlieni is still unclear; the variation exhibited by adult kumlieni appears unprecedented in any other single taxon of large white-headed gull rendering it intermediate in appearance between Thayer's and Iceland Gulls (Garner & Mactavish, 2001; Howell & Mactavish, 2003). A recent paper by McGowan & Kitchener (2001) presents strong new evidence that kumlieni is not a valid taxon but a variable intermediate form resulting from introgressive hybridisation between thayeri and glaucoides lineages. While there is clearly a need for more detailed and controlled research into the taxonomic relationship between thayeri, kumlieni and glaucoides, the most recent work on the subject suggests that the elevation of thayeri to full species status is warranted. To the great credit of its finder, the Galway bird was identified at a time when birders here were just beginning to latch on to the regular occurrence of Kumlien's Gulls and few knew anything about Thayer's Gull. At the time, Grant (1986) presented by far the most authoritative treatment of the identification of Thayer's Gull, and though helpful, it summarised what we can now see to have been a rather simplistic understanding of the identification problems associated with thayeri and its closest congeners. The occurrence of the Galway bird undoubtedly stimulated much of the subsequent interest in this taxon in Europe and it is therefore rather paradoxical that, of the six so far claimed in Ireland it has, perhaps, the most questionable credentials. Despite the fact that its identification has been somewhat glossed over in accounts of the subsequent Thayer's in Ireland, the case for the Galway bird being regarded as a putative Thayer's cannot be easily dismissed. It was identified on the basis of showing many of the characters at the time associated exclusively with Thayer's Gull (see Kilbane, 1989). We now know that some of these characters are not as exclusive as was believed, but nevertheless several features point, at the very least, to a strong influence of thayeri in this bird; it is even possible that it is as good a candidate as any of the subsequent ones recorded here, but that the less than perfect condition of its plumage renders it very difficult to assign to species with confidence, on current knowledge. The IRBC will continue to have an open mind on this claim, until such time as the identification of such difficult birds becomes clearer. 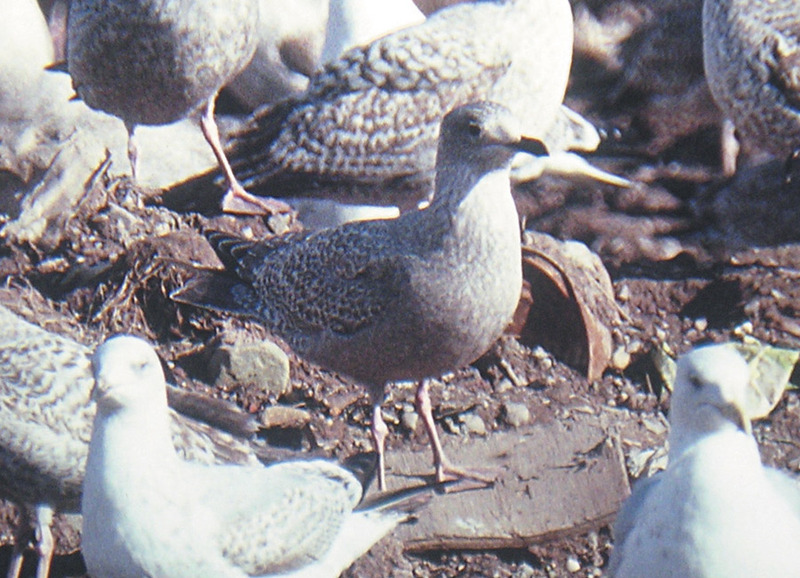 Juvenile / first-winter Thayer's Gull Larus thayeri, Cork City Dump, February 1990 (Photo: Paul Archer). The juvenile/first-winter birds at Cork and Newport were virtually identical to each other, showing all of the characters we have now come to associate with first-winter Thayer's: an Iceland Gull-like impression, rather dark plumage overall, solidly marked dark tertials, pale inner webs to the outer primaries with pale window on inner primaries, dark secondary bar, tail band etc). Adult Thayer's Gull Larus thayeri, Killybegs, Donegal, February 1998 (Photo: Killian Mullarney). At the time, the occurrence of an adult at Killybegs was heralded as the first unequivocal record of Thayer's Gull in Europe, but in some respects, this is the most difficult of all the records to assess. While it would appear, based on current knowledge, to fall within the range of variation exhibited by Thayer's, it showed some characters not typical of the majority of Thayer's. For example, it lacked a dark mark on the fifth primary (P5), a feature that had been put forward as diagnostic by some authors (Zimmer, 1991) but which has more recently been reported to be shown by only 75% of adults wintering in central California (Howell & Elliot, 2001). In addition, in more than 80% of the adults examined in the latter study (n=90), the black on the outer web of P9 was not interrupted by the white mirror. In the Killybegs adult this was not the case; the white mirror clearly extended all the way across the outer web of P9. While the relevance of such minutiae may seem questionable in a case where the overall appearance of the bird seems so 'good' for Thayer's, clues to intergrade identity in the thayeri/kumlieni complex will not necessarily be more obvious than this. Given that in these two respects the Killybegs bird did not conform to the majority of 'true' Thayer's, it could be argued that its identification as Thayer's is unsafe. However, no evidence has been put forward to demonstrate that these minority characters are necessarily indicative of kumlieni influence, so they do not, on current knowledge, present an obstacle to identifying the bird as Thayer's. After agonising over the possible significance of these and other minutiae which might indicate some kumlieni influence in the Killybegs bird, the IRBC's eventual decision was a pragmatic one: we cannot be expected to be able to determine the precise genetic make-up of such ostensibly pure-looking birds on the basis of very subtle, subjective and possibly insignificant morphological characters. So far as we are aware, nothing in the appearance of the Killybegs bird is 'wrong' for Thayer's so, until such time as a case can be made for it not being a pure Thayer's we are inclined to regard it as an acceptable record. The assessment of the Irish Thayer's Gull records has presented the IRBC with a rather unique dilemma. Seldom, if ever, has there been a situation where the identification of such well-documented records has been so difficult to assess. The Irish monopoly of Thayer's Gull records until recently is probably a reflection of the intense interest in gull identification of a relatively small number of observers, coupled with our strategic location on the west coast of Europe. Up until the end of 1999, the Irish records represented the only published claims of this species in the Western Palearctic region. However, the two recent records of first-winter Thayer's Gulls in Norway (Mjøs, 2000) and Denmark involved birds very similar in appearance to some of the Irish individuals. Knowledge of the identification of the complex formed by thayeri, kumlieni and glaucoides is still evolving. There is a clearly a need for further research to accurately determine just how much variation exists in all three forms at all ages. It is almost certain, given the potential for further refinements in our understanding of gull identification and taxonomy that the Irish records will have to be reviewed in the future. Until then, the above treatment should be regarded as a 'best guess' based on the current knowledge of this complex group. No doubt, time and further research will inform us as to whether or not these decisions are the correct ones. The IRBC wishes to thank the following people who at some time or other have offered opinions on the Irish records: Mashuq Ahmad, Jon Dunn, Martin Elliot, Martin Garner, Steve Howell, Bruce Mactavish, Anthony McGeehan, Richard Millington and Dave Sibley. Alf Tore Mjøs (Norway), and Morten Bentzon Hansen and Knud Pedersen (both Denmark) kindly provided information regarding the status of the Norwegian and Danish records respectively. American Ornithologists' Union (AOU). 1998. Check-list of North American Birds, 7th edition. AOU. Brooks, W.S. 1915. Notes on birds from east Siberia and arctic Alaska. Bulletin of the Museum of Comparative Zoology 59:261-413. Cottridge, D. & Vinicombe, K. 1996. Rare Birds in Britain and Ireland: a photographic record. Collins/Birding World. Enticott, J. & Tipling, D. 1997. Seabirds of the World. New Holland. Fitzharris, J.E. (ed.) 1997. Irish Rare Birds Committee Report. Irish Birds 6: 91-96. Garner, M. & McGeehan, A. 1998. Identification of juvenile and first-winter Thayer's Gull. Birding World 11: 94-101. Garner, M. & Mactavish, B. 2001. The in-between gull. Birdwatch January 2001: 26-31. Grant, P.J. 1986. Gulls: a guide to identification. 2nd edition. Poyser. Howell, S.N.G. 1998. Shades of gray: the Catch 22 of Thayer's Gull? Birders Journal 7: 305-309. Howell, S.N.G. & Elliott, M.T. 2001. Identification and variation of winter adult Thayer's Gulls with comments on taxonomy. Alula 7:130-144. Howell, S.N.G. & Mactavish, B. 2003. Identification and variation of winter adult Kumlien's Gulls. Alula 9:2-15. Kilbane, T. 1989. Thayer's Gull in Galway - a new Western Palearctic bird. Birding World 2: 125-129. Kristensen, P.H. 2002. Thayers Måge - Gæst fra arktisk Canada. Fugle i felten 8(2): 24-26. Klein, S., Pedersen, K. & Thorup, K. 2003. Sjældne fugle i Danmark og Grønland i 2002. Dansk Orn. Foren. Tidsskr. 97(3) (in press). McGeehan, A. & Millington, R. 1998. The adult Thayer's Gull in Donegal. Birding World 11: 102-108. McGowan, R.Y. & Kitchener, A.C. 2001. Historical and taxonomic review of the Iceland Gull Larus glaucoides complex. British Birds 94: 191-195. Mjøs, A.T. 2000. The Thayer's Gull in Norway. Birding World 13: 10-11. Mjøs, A.T. & Solbakken, K.A. 2001. Sjeldne Fugler i Norge i 1999 og 2000. Ornis Norvegica 24: 3-59. Mjøs, A.T. 2002. Eskimomåke Larus thayeri i Bergen I Januar 2000 - ny for Norges fauna. Ornis Norvegica 25:4-18. Pittaway, R. 1999. Taxonomic history of Thayer's Gull. Ontario Birds 17: 2-13. Smith, N.G. 1966. Evolution of some Arctic gulls (Larus): an experimental study of isolating mechanisms. Orn. Monographs no. 4 AOU. Snell, R.R. 1989. Status of Larus gulls at Home Bay, Baffin Island. Colonial Waterbirds 12:12-23. Snell, R.R. 1991. Conflation of the observed and the hypothesized: Smith's 1961 research in Home Bay, Baffin Island. Colonial Waterbirds 14:196-202. Sutton, G.M. 1968. Review of: Smith NG. 1966. Evolution of some arctic gulls (Larus): an experimental study of isolating mechanisms. Auk 85: 142-145. Wilson J. 1990. Thayer's Gull in County Cork. Birding World 3: 91-93.